Safety for both resident/patient and caregiver. Compliance with new international standards. Equipment that is robust, intuitive and easy to use. Solutions focused on quality of care for residents/patients. The new Enterprise 8000 has been independently tested by a globally renowned organisation to certify that it complies with the latest stability, dimensional and safety requirements of the IEC60601-2-52 standard. The bed comes with split folding safety sides and integrated bed controls. The new Enterprise 8000 helps to reduce the risk of staff injuries and provides a safer environment for the caregiver thanks to the extra low height – a key advantage in reducing the risk of injury through falls - and underbed lighting – the bed exit area on both sides of the bed is illuminated, to help improve resident/patient safety and security. Our single button controls are intuitive and easy to use, thanks to clear and simple icons. Single touch functions can be used for key functions, such as auto CPR, 30° backrest angle, auto contour, cardiac chair position, low height and extra low height, and Trendelenberg/reverse Trendelenberg positioning. The backrest will pause when raised to an angle of 30°, ensuring easy and positive backrest adjustment time after time. 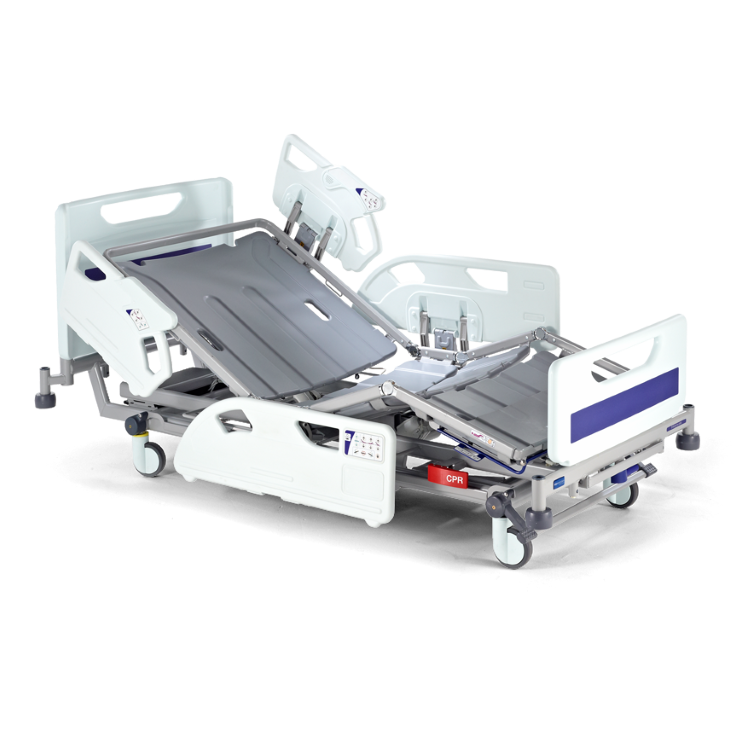 The caregiver can easily adjust the bed into a cardiac chair position with the easy-to-use control panel, by simply selecting the relevant icon. The Enterprise 8000 has been designed with open architecture and no base cover to allow easy access for cleaning, decontamination, maintenance and service.